At Corvette Clinic, we bring Australia the ultimate in Corvette conversions, restorations and repairs. Our business brings over 30 years experience in working with Corvettes. At Corvette Clinic we have converted hundreds of vehicles to right hand drive, all with the required compliance for registration in all Australian states. Our quality work not only safeguards your investment, but ensures that every aspect of safety, performance, appearance and comfort is maintained. What started out as a love for America's greatest sports car has turned into a business that has arguably the best reputation for quality right hand drive Corvette conversions. Our aim is to help you enjoy your Corvette, irrespective of the model. 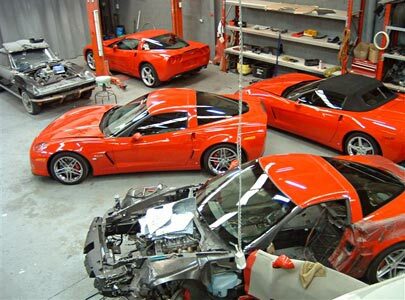 We have a proven track record of restoring and repairing Corvette models - old and new. We specialise in converting the very latest model Corvette, direct from the US. We have approval for converting all the current 'C6' Corvette models - Coupe, Convertible, Grand Sport, Z06 and the awesome ZR1 - and have converted many examples of all the variants, including both manual and automatic. We also convert all 'C5' models. See our RHD Conversion page for more details and images. Having converted Corvettes for over 30 years, including the world's first right hand drive new ZR1s, now we're applying our expertise to the new Camaro! We convert all Camaro coupe and convertible models, including the supercharged ZL1. So, if you want a Corvette or Camaro in Australia, there is only one place to go - Corvette Clinic. We can help you find your dream car, convert it from left hand drive to right, or restore it to its former glory. Bring your car to us - it is in the safest of hands at Corvette Clinic. Call or contact us today!